Tomato yellow leaf curl disease (TYLCD, genus Begomovirus, family Geminiviridae) is one of the factors that severely limits tomato production in Iraq, as it attacks tomato cultivated in both protected and open fields (Al-Fadhal, 2012). In Iraq, TYLCD incidence may reach up to 100% and can cause economic losses between 50-90%, especially when the virus infects tomato plants in the early growing stages (Al-Ani et al., 2011). In April 2010 leaf curling, yellowing and a reduction in leaf size symptoms were observed on tomato in fields in Baghdad, Iraq. A total of 49 tomato samples were collected and total nucleic acids were extracted from samples using the CTAB protocol described by Abarshi et al. (2010). PCR amplifications of extracted nucleic acids were performed using Red Hot DNA polymerase (Thermo Scientific Inc., USA) and begomovirus specific primers (Deng et al., 1994). Rolling circle amplification (RCA) was performed using an Illustra Templiphi 100 Amplification Kit (GE Healthcare Limited, UK) according to the manufacturer’s protocol. Restriction digestion of RCA products with NcoI was performed to release the full-length fragment of the amplified viral DNAs, which were gel purified, cloned and sequenced (Bioscience Gene Service, UK). Based on PCR and sequence analyses using MEGA 5 software (Tamura et al., 2011), six out of 49 tomato samples (12%) were found to be infected by TYLCV. MEGA BLAST search of sequences amplified by Deng primers revealed that sequences isolated showed 98% maximum identity with Tomato yellow leaf curl virus GenBank sequences. The full length sequence referred to as TYLCV IRQ is 2780 bp in length (GenBank Accession No. JQ354991). Sequence comparison of full length TYLCV-Iraq1 using MEGA BLAST search was performed against available GenBank sequences. TYLCV IRQ shared 99% identity with TYLCV isolates Mauritius (HM448447) from Mauritius, RE4 (AM409201) from Reunion Island and Almeria (AJ489258) from Spain. The primer pair ‘TYLCV-F/TYLCV-R’ (TYLCV-F, 5'-GGATAAGCACATGGAGATGTG-3' and TYLCV-R, 5’-CAAGATAACAGAACAC AGCCA-3') was designed from the TYLCV IRQ isolate to amplify a 1.7 kb fragment from the TYLCV genome regions between 1394-2463 nucleotide positions. This primer could detect TYLCV in all six tomato samples previously tested using the Deng primer set (Fig. 1). Phylogenetic (neighbour-joining) analysis of full sequence of TYLCV IRQ and those sequences from GenBank grouped TYLCV IRQ within the TYLCV cluster but diverged this sequence into a separate clade from the TYLCV isolates from Spain, Reunion Island, Morocco, New Caledonia, and The Netherlands (Fig. 2). This separate grouping of TYLCV- Iraq1 from other GenBank TYLCV sequences is supported by a bootstrap value of 89%, which may indicate a distinct origin for TYLCV IRQ. This study provides the first molecular evidence of TYLCD in Iraq. Figure 1: Gel electrophoresis pattern showing 1.7 kb DNA fragments amplified by TYLCV-F/TYLCV-R primers designed from the TYLCV IRQ sequence in tomato samples (Lanes 1- 9). W: water control and L: 1 kb DNA marker (New England Biolabs, UK). 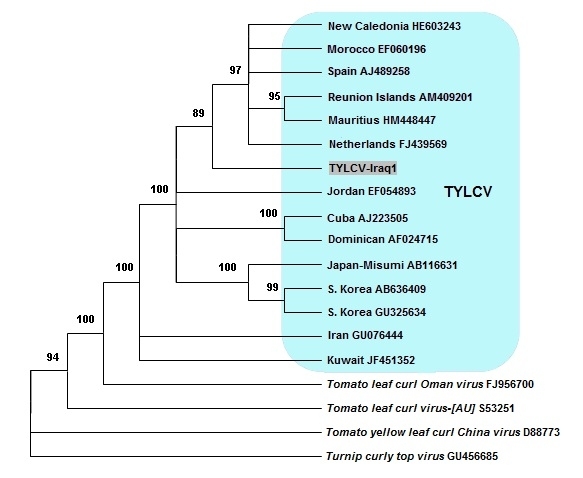 Figure 2: Neighbour-joining phylogenetic tree based on full-length sequences of TYLCV IRQ isolated from tomato samples in Iraq (highlighted), TYLCV isolates and other geminiviruses obtained from the GenBank database. The percentages of replicate trees in which the associated taxa clustered together in the bootstrap test (1000 replicates) are shown next to the branches. Branches having bootstrap value less than 70% have been collapsed. The authors would like to Dr. A. Al-Kuwaiti, and Mr. M. A. Adhab for their excellent technical assistance. Al-Ani RA, Adhab MA, Hamad SA, 2011. Evaluation of the efficiency of different techniques for extraction and purification of Tomato yellow leaf curl virus (TYLCV). Journal of Baghdad for Science 8, 447-452 [In Arabic, English abstract]. Deng D, McGrath PF, Robinson DJ, Harrison BD, 1994. Detection and differentiation of whitefly-transmitted geminivirus in plants and vector insects by the polymerase chain reaction with degenerate primers. Annals of Applied Biology 125, 327-336, 1994.